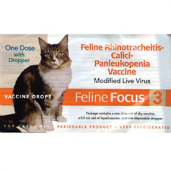 Shop for cat vaccines at VetDepot.com. Panleukopenia, also known as feline distemper or feline parvovirus, is a contagious, viral disease of cats. It most commonly affects young, inadequately vaccinated animals that are grouped together in shelters, pet stores, or feral cat colonies. Panleukopenia is often fatal even with aggressive treatment. "Cats with panleukopenia typically vomit, have diarrhea, and lose their appetites, resulting in potentially fatal dehydration." Why Should Cat Owners Be Concerned? The virus that causes panleukopenia is extremely hardy. It can survive for years in the environment and is found almost everywhere. Most kittens derive some immunity from their mothers and are therefore protected early in life. But, if they do not receive protective vaccines around the time that their maternal immunity is wearing off, they can become deathly ill when they come in contact with a highly contaminated environment. Cats with panleukopenia shed huge amounts of the virus in their vomit, diarrhea, and other bodily secretions. The panleukopenia virus attacks rapidly dividing cells–-primarily the parts of the bone marrow that produce white blood cells and the lining of the intestinal tract. As a result of damage to the intestinal tract, cats with panleukopenia typically vomit, have diarrhea, and lose their appetites, resulting in potentially fatal dehydration. A lack of infection-fighting white blood cells puts cats at high risk for secondary bacterial infections, which can also prove to be deadly. When a kitten is infected with the panleukopenia virus during late gestation, the virus disrupts the development of the cerebellum-–the part of the brain responsible for coordinating movement and balance. The resulting condition is called cerebellar hypoplasia. Affected cats tend to walk unsteadily and develop tremors whenever they concentrate on a specific task. Cats with cerebellar hypoplasia may be able to function adequately in a protected environment and improve slightly as they adapt to their condition, but they will never move normally. Veterinarians diagnose panleukopenia based on a cat's clinical signs, poor vaccination history, and the results of laboratory tests. Finding an extremely low white blood cell count in an at-risk, young cat is fairly definitive. Canine parvovirus snap tests can also identify the feline panleukopenia virus in a cat's stool sample, although recent vaccination may result in false positive results. Additional tests are available in complicated cases. Treating panleukopenia involves supporting the body and dealing with secondary bacterial infections until the immune system has a chance to recover and fight off the virus. Unfortunately, most cats with the disease die even when they are treated with intravenous fluids, antibiotics, anti-nausea medications, and blood or plasma transfusions. Thankfully, panleukopenia is easily prevented by vaccination on an appropriate schedule. 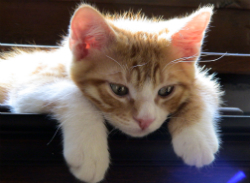 In general, kittens should be vaccinated against panleukopenia at around 8, 12, and 16 weeks of age (roughly every 3 to 4 weeks) and receive a booster about a year later. From then on, revaccination every three years should be sufficient to maintain protective immunity. Panleukopenia is typically combined with herpes virus and calicivirus in a single vaccine that is called FVRCP or feline distemper.